On Saturday, February 3, 2018, there was an all-day celebration of the life and work of the renowned British-Nigerian writer, Buchi Emecheta, who passed away in January 2017. It was a gathering of writers, critics, artists, publishers, literature enthusiasts and culture activists from all over the world, including London and other parts of the U.K., France, Germany, U.S., Canada, Nigeria, Ghana, Kenya, South Africa, and the Caribbean, etc. the event was held at University of London, London. As the organisers stated in the flyer announcing the event, the celebration included a curated installation of The Life and Times of Emecheta, panel discussions, excerpts from some of her best-known novels, music and dance and, of course, Nigerian food. To the credit of the organisers, Buchi Emecheta Foundation, all these were accomplished, and more. In fact, there were also a colourful cultural tribute from the female members of Ibusa community in London and the official launch of Buchi Emecheta Foundation and Omenala Press’ attractive edition of Emecheta’s books. It was a day studded with a variety of activities that held the complete attention of participants and the audience from 9:30 am until 8:00 pm, when the event was declared closed. The event not only marked the first anniversary of the passing of this great African cultural icon and prolific writer, but also provided opportunity for critics, scholars, publishers, readers and students alike to hold a public conversation about Emecheta’s legacy. 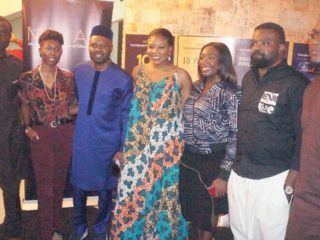 Among the distinguished personalities, who were invited, as speakers at the event, were Professors Carole Boyce Davies, Ernest Emenyonu, Marie Linton Umeh, Msiska Mpalive, Akachi Ezeigbo and Oty Agbajoh-Laoye. Other notable academics included Dr. Louisa Uchum Egbunike, Delia Jarrett-Macauley, Alastair Niven, Ade Solanke, Maureen Roberts and Veronique Tadjo (who is also a distinguished writer). Also present were award-winning writers and artists, including Leila Aboulela (Sudanese winner of the first Caine Prize for African Writing), Victor Ehikhamenor, Bernardine Evaristo, Chikodili Emelumadu, Grace Nichols, Irenosen Okojie and Chibundu Onuzo. Among the major speakers were renowned publishers, including Margaret Busby (Emecheta’s first publisher), James Currey (of Heinemann fame), Bibi Bakare-Yusuf, Nana Ayebia Clark, Sylvest Onwordi (Emecheta’s first son and publisher of Omenala Press), and Gersy Ejimofo. Some of the other well-known speakers included Kadija George, Bola Mosuru, Sheila Ruiz, Onyekachi Wambu, Marcelle Akita Yvonne Mbanefo, Zaahida Nabagereka and the distinguished translator, Wangui wa Goro, who was the event coordinator and chair. The event opened with the breaking of the kola nut and pouring of libation, which was performed by an Ibusa elder, Diokpa of the day. The excited, mixed audience gave a rousing Ise to the Diokpa’s prayer. Then followed readings from Emecheta’s classics by two younger writers. It was well-accomplished and the audience listened attentively and appreciatively. 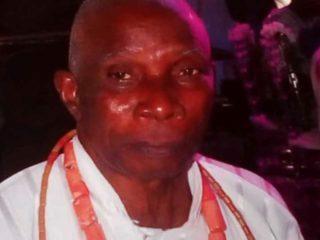 It was clear that Emechata was a writer with great descriptive power and a gifted storyteller. 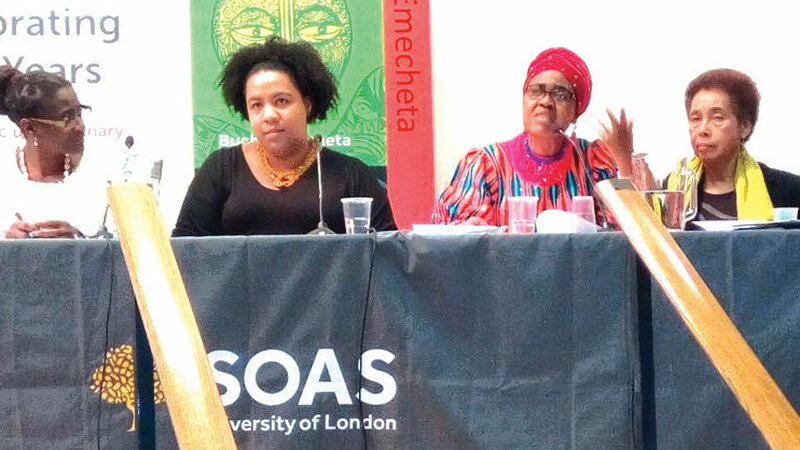 The keynote panel proved to be well constituted, as all the speakers did justice to the issues raised, including Emecheta’s family life, her many books, including sixteen novels, her status as a feminist writer, her reception in different parts of the world, and the views of both male and female critics of her work. Much information was made available to the attentive audience on these subjects. Margaret Busby revealed that when Emecheta was asked which of her books was her favourite, she replied that her books were like her children and she did not have a favourite but liked them equally. Carole Boyce-Davies dwelt on Emecheta’s assertion that she was a feminist with a small ‘f’ and argued that Emecheta did not say this to trivialise feminist concerns in her life and work, but to open the way in different directions and draw the attention of her readers and the authorities to the negative issues affecting not only women but men and children in society. Her concerns, therefore, relate to the well-being of the whole community, to justice, fairness and gender equity. Boyce-Davis said that her generation started assessing and giving close attention to African women’s writing and they were attacked, but they did not give up. This reaction of the iconic writer set the audience laughing hilariously. 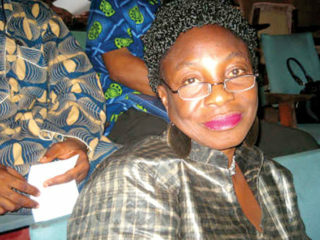 Sylvester Onwordi, Emechata’s publisher-son and Director of Buchi Emecheta Foundation, informed the audience that her prolific-writer-mother left many manuscripts – plays, short stories, children’s stories, etc – in her archives, and that the Foundation has not decided what to do with them. He admitted that there was a lot of work to do.Mpalive Msiska praised Emecheta for providing teachable books, which are used in schools and colleges, and adding that he uses them at Birbeck College, University of London, where he teaches literature. Other panels followed after the keynote panel had set the tone. The Tribute Panel, chaired by Louisa Egbunike, had five speakers, including Ezeigbo, Emenyonu, Marie Umeh, Kadija George and Grace Nichols. One of the fascinating ideas that came out of this panel was Emenyonu’s revelation concerning the inspiration for the writing of Emecheta’s classic, The Joys of Motherhood. He claimed that the novelist had continued to write her life into fiction, for the novel was inspired by an incident Emecheta had with her daughter, who wanted to study medicine but was opposed by Emecheta. While paying tribute to Emecheta, Nichols confessed that she got the inspiration to write her Commonwealth Prize-winning collection of poems – I Is a Long Memoried Woman – from the novelist, and, describing Emecheta’s influence on her, called Emecheta her “Guardian Angel.” In her tribute to the writer, Ezeigbo described Emecheta as a phenomenal African female writer, and argued that though many critics approach Emecheta’s work mainly from the feminist perspective, it is obvious that her appeal as a global writer and human rights activist goes beyond feminism to reveal the humanity of every individual despite all the divisive factors that polarize people and issues, including those relating to gender, ethnicity and race. IN its contribution, the publishing panel made some bold statements. Busby asked those who are writers among the audience to raise their hands, and they did. She then asked those who are publishers to indicate by raising their hands, too. The result of this brief survey was that whereas many raised their hands as writers, only a few hands shot up as publishers. Busby then pointed out the fact that writers outnumber publishers, but emphasised that publishers are powerful, for they get information across, nurture and groom writers and help them to get their books in print. She advised writers to edit their work well before sending out to publishers. She then added with satisfaction that she was Emecheta’s first publisher. This got the audience roaring with laughter. Currey pointed out that the African Writers Series (AWS), which he helped to set up, gave African male writers the confidence to submit their manuscripts and get published, saying the women writers came later. Bakare-Yusuf of Cassava Republic Press said one of the reasons she focused on publishing women writers was to go beyond what Heinemann’s African Writers Series was doing. 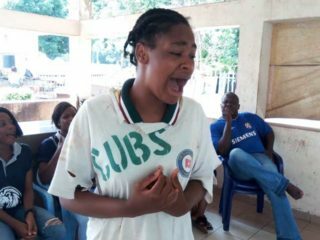 She said she wanted to project African women writers. Other panels also took turns to air their views and contribute to the interesting discussions. It was a harvest of ideas, opinions and interesting discussions on ‘Love and Discovery in Buchi Emecheta’s Works,’ ‘Legacy & Heritage: The Buchi Emecheta Foundation,’ ‘Story-telling Workshop and ‘Afrikult’ Workshop – Celebrating Buchi Emecheta.’ There were more readings from Emecheta’s work by Anita-Joy Uwajeh and Louise Kwarteng.Next, London-based Ibuza women, beautifully dressed in traditional Igbo attire, stormed the stage with an exciting display of their traditional dance. It was indeed a beautiful sight. And then came the long-awaited event – the Book Launch and Prize Giving. The winners of a competition built around Emecheta’s life and work were announced and their submissions highlighted on a projector. It was heart-warming to see a mother and her 10-year-old daughter among the winners. Afterwards the reissued titles of Emecheta’s books were presented to the public. It was announced that the Nigerian artist and writer, Ehikhamenor’s artwork is featured on the new editions of Emecheta’s work published by Omenala Press. Hundreds of copies of the books were bought by the admiring audience. Finally, everyone took the stairs and ascended to the next floor for the drinks reception, including Ibuza celebration and performance. It was a continuation of the entertainment that had been provided earlier when delicious Nigerian food was served for lunch at about 1:15pm. The air of conviviality pervaded the atmosphere, as people sipped red and white wine or took other drinks they preferred. Everyone was glad to have witnessed the wonderful and well-planned event – the celebration of a great writer, a global literary icon, whose career covered over four decades, bestriding the 20th and 21st centuries. There were open mic tributes and finally Onwordi and Solanke delivered the vote of thanks. Onwordi promised that the celebration would be an annual event. Thus, the memorable event came to an end.